ABF Singapore Bond Index Fund was one of the earliest Exchange Traded Funds (ETFs) listed on the Singapore Exchange (SGX). Since its inception on 31st Aug 2005, the ETF has grown significantly and now has Assets Under Management (AUM) of S$869 million as of 30th Apr 2017. Over the course of 12 years, the ABF Singapore Bond ETF has gained about 36% or 2.7% per year. This return would have beat most of the Singapore fixed deposit rates and even our CPF Ordinary Account’s 2.5% p.a. interest. It is one of the four ETFs that is currently approved under the CPF Investment Scheme. This allows retail investors to invest in the ETF via their CPF Funds. 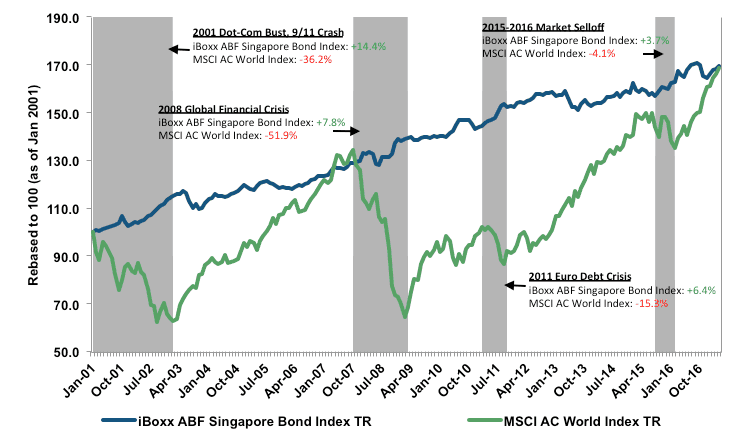 On top of that, the ABF Singapore Bond Index Fund is also an Excluded Investment Product. Investors do not need to be pre-qualified before they can make purchases. Being a relatively low risk product, I see 3 groups of investors who would benefit from having the ABF Singapore Bond Index Fund in their portfolios. A financial advisor would typically recommend a bond product if you cannot afford to lose much of your investment capital. With a myriad bond investment options available, it can be a challenge to compare and decide. Here is a quick summary of the products available. Government Bonds Can be very high investment grade due to excellent credit rating. Interest rates are low especially for high investment grade bonds. Quasi-Government Bonds Higher interest rates than government bonds without much more credit risk. May only be available to institutions and not individuals. Examples are HDB and Temasek Holdings Bonds. Corporate Bonds Usually higher interest rates than quasi-government bonds. Mostly for accredited investors. The quantum is large at $250,000. This makes diversification difficult for retail investors. Bond Unit Trusts Professionally managed bond portfolio. With a competent manager, there is a possibility of achieving better-than-market returns. Higher fees to buy and own the Unit Trusts. Selecting good managers can be as difficult as selecting the right bonds. Bond Exchange Traded Funds (ETFs) Low fees to get access to bonds only available to institutions. Professionally managed. Match market returns with no outperformance. A wealthy person may turn to a private banker for advice and to manage his or her portfolio of Government and Corporate Bonds. Unfortunately only a fraction of bond options are available to the retail investor. In that case, a Bond Unit Trust or Bond ETF would be more suitable because he can achieve diversification with a smaller amount of capital. Comparatively, I prefer a Bond ETF over a Bond Unit Trust because fees of the former are several times lesser than the latter. If compounding effects can work for you, compounding costs can also work against you! The ABF Singapore Bond Index Fund is classified as a low risk product because it invests largely into sovereign and quasi-sovereign bonds issued or guaranteed by the government of Singapore or any government of People’s Republic of China, Hong Kong SAR, Indonesia, Korea, Malaysia, Philippines or Thailand. The snapshot of the portfolio holdings as of 30 Apr 2017 were predominantly Singapore Government bonds, which has been rated AAA across all 3 major credit rating agencies consecutively for at least 19 years (Standard & Poor’s, Moody’s and Fitch). 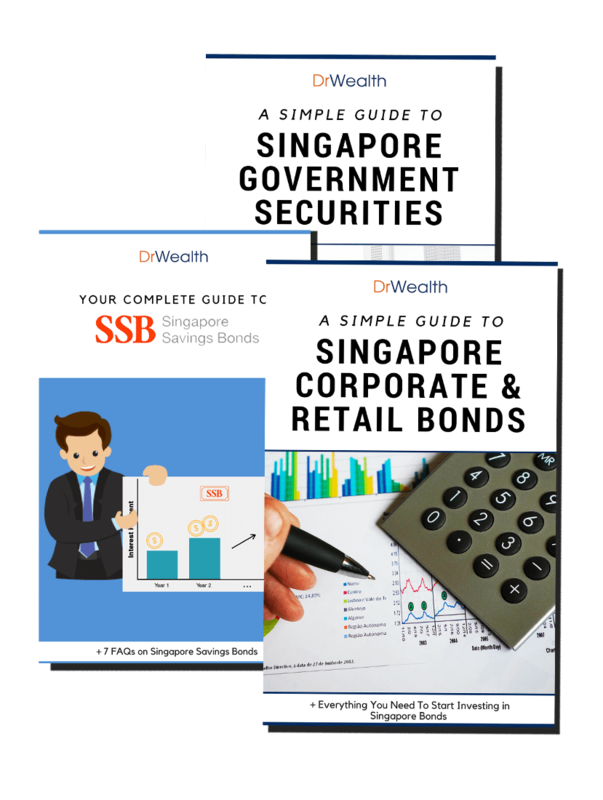 Moreover, Singapore Government Bonds are one of the world’s highest-yielding AAA-credit rated government bonds. The Fund also invests in quasi-government bonds issued by entities such as HDB, Temasek, and LTA. Both these Singapore Government and Quasi-government Bonds are placed in the risk-free category. All in all, the ABF Singapore Bond Index Fund is a great instrument for the cautious investor who is not in a rush and prefers slow and steady gains. Modern Portfolio Theory states that diversification is the only ‘free lunch’ in the world. Why is that so? Studies have shown that a portfolio made up of stocks and bonds could achieve higher returns and lower risks, than a portfolio holding purely stocks or bonds. This diversification works best when the stock and bond prices move in opposite directions. 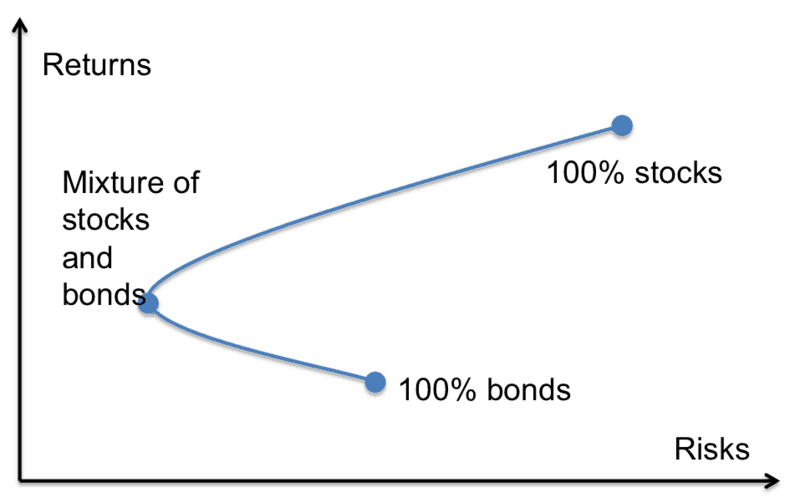 The ABF Singapore Bond Index Fund has a tendency to be negatively correlated to stocks, as shown in the rolling 3 year returns of the Fund’s index against the broad stock index chart. This makes it suitable for a stock investor to allocate parts of the portfolio to the bond fund. 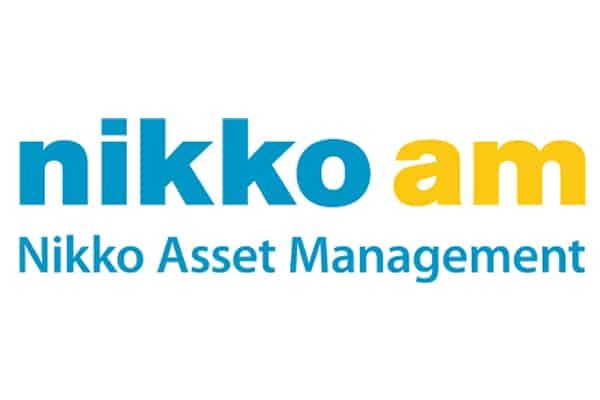 Nikko AM Asia, as of 30 April 2017, returns in SGD terms, using monthly returns. You would have appreciated the value of bond diversification during major stock market crashes such as the Global Financial Crisis in 2008. Stocks lost more than half of their value while the ABF Singapore Bond Index Fund did better than normal during the same period. You can look at the following chart that compares the bond index against the stock index. 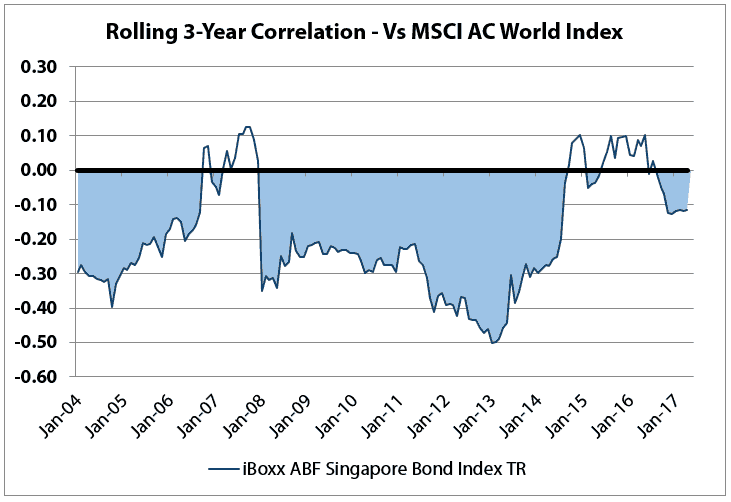 The iBoxx ABF Singapore Bond Index made gains while the MSCI AC World Index had losses during the various stock market crises in the past 16 years (indicated by the shaded areas). When their movements diverge significantly, investors are presented with a chance to rebalance their portfolio by selling the asset class that has gone up and buying the other asset class that has gone down. In doing so, investors are in effect buying low and selling high. This act alone is able to generate additional returns. Hence, if you are 100 percent in stocks, it might be timely to consider adding some bonds into your portfolio to lower your risks. The good news is that the ABF Singapore Bond Fund is traded on the Singapore Exchange. An investor can easily buy and sell the ETF, just like he or she would with any stock. Unlike a Unit Trust for which a valuation is only derived at the end of the day, the ABF Singapore Bond Fund is priced throughout the entire trading day. As a result, it is more transparent and convenient. You can choose to rebalance your stocks and bonds immediately on the same trading day and decide on the price you want to buy and sell via your internet trading platform. There is no need to go through an agent, which you would have to if you are buying or selling a Unit Trust. Finally, having both your stocks and bonds investments on the same platform would facilitate your monitoring and rebalancing of your portfolio. #3. The Beginner Investor – You have little capital but see the need to start investing right now. Most people have the impression that they need a large capital to be able to invest in Bond products. This is true if you are investing in Over-the-Counter corporate bonds which would typically require a minimum of S$250,000. These bonds are often illiquid when you want to sell them before maturity. On the other hand, affordable retail corporate bonds are limited and give very little choices for an investor to build a diversified bond portfolio. Thus ABF Singapore Bond Index Fund offers the beginner investor a low risk bond portfolio at affordable investment amounts and having the ease of buying and selling the units over the Singapore Exchange (SGX). Since 2015, the lot size has been reduced to 100 shares / units on the SGX. This means that if the ABF Singapore Bond Index Fund is trading at $1.164, the minimum investment is only $116.40! However, I would caution against investing such a small amount each time because the minimum brokerage fee of $25++ incurred would represent 25% of the investment amount. Typically, I would prefer to keep transaction fees below 1% of my investment amount. If you are only looking to invest in small amounts regularly, fret not. There is a simple way to get around it. For amounts as little as S$100 per month, DBS/POSB charge only 0.5% for their regular investment plans. A $100 investment would only cost $0.50 in fees, making it highly affordable for just about anyone. There is no excuse not to start investing now! Below is a comparison among the monthly investment plan providers with the ABF Singapore Bond Fund as one of the offerings. Table 3: Comparison of ABF Singapore Bond Index Fund Monthly Plan Comparison. If you have just finished school and started working, this is one of the best ways to get started. As I have shared the benefits of the ABF Singapore Bond Index Fund, I must also share some of the risks I would be concerned about. The following is not exhaustive and you should read the Product Highlight Sheet, Factsheet and Prospectus for more information. You should also seek professional advice or contact the issuer Nikko Asset Management when in doubt. Interest rate risk – bond prices can be sensitive to interest rate changes. Higher interest rates may result in lower bond prices. Tracking error – the Fund may not be able to closely replicate the index it is tracking and result in deviations in the performance of the Fund. Credit rating downgrade – a downgrade in the credit rating in any of the bonds held by the Fund may result in lower bond prices. Whether you are someone who prefers a higher level of certainty in your investments, or an equity investor looking to diversify your portfolio, or even someone new to the workforce, the ABF Singapore Bond Index Fund presents a secure, easily accessible and affordable investment option. This article is written in collaboration with Nikko Asset Management. The author aims to share his views about how he would find the product useful and he is not recommending you to buy. You are responsible for your own investment decisions and their outcomes. Little known resources that will help you start investing in Bonds and MORE! If I am not mistaken, transaction costs for ABF Bond Fund is only 0.5%. Which broker are you referring to? Posb invest saver only charges 0.5% for ABF bond fund; 1% for Nikko STI ETF. So that’s another reason to diversify and invest in the ABF bond fund. You are right about the sales charge, thanks for pointing that out! Thank you for the great post, it has been of much insight. I have been searching up the performance / record for iBoxx ABF Singapore Bond Index which the ETF tracks for hours but with no luck. It will be of great help if you could point me to the right way pretty please. ‘Benchmark’ is the index returns.